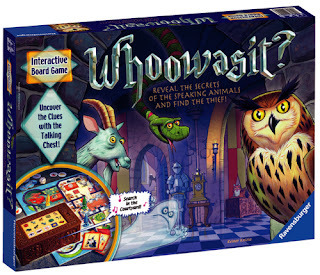 Board Game Store : EuroGames : Strategy Games : Puzzles : Off The Charts Games: Game Profile: Whoowasit? Byline Reveal the secrets of the talking animals and find the thief! The people of the castle are in a panic: someone stole the king's magical ring! The ring protects the kingdom against the evil wizard. The castle animals witnessed the thief during the night and can five clues to what the thief looks like. Only children can understand the animals when they speak, so it all depends on you to save the kingdom! The chest contains intelligent electronics that ensure each game is different and exciting every time. Listen as the animals speak with the animals or engage in magic. Work together as a team to find the magical ring before your time runs out!